Enjoy the peace and serenity of a natural setting, but have all the amenities and high-quality culture just outside your front door. From fine dining to quick and casual, there is no shortage of restaurants available within walking distance of your new condo. Linger over a true Italian meal at Bacco Trattoria and Mozzarella Bar, or belly up for a creative cocktail and the contemporary American menu at 4580. Just a few blocks down Broadway, Dagabi Cucina offers traditional, Spanish-style tapas and a daily happy hour. If you’re feeling cozy, grab some takeout from China Gourmet or a slice of pizza from Protos Pizzeria Napoletana and enjoy dinner on your expansive patio. Coffee and treats can also be found at nearby Spruce Confections, Lucky’s Bakehouse, and Logan’s Espresso House. Dakota Flats is also well positioned for accessing the abundant outdoor opportunities offered in Boulder. Cyclists can often be found taking a break on the patio at Amante, enjoying a coffee. The nearby Boulder Sport Recycler and Boulder Cycle Sport stores make it easy to get all the gear you need and keep your current gear in working order. The Foothills Trailhead is just outside your door – it couldn’t be easier to make time for an outdoor jaunt, no matter how big or small. Take a stroll around picturesque Wonderland Lake or enjoy a longer hiking adventure on the Hogback Ridge Trail and the Old Kiln Trail. Take your furry four-legged friend for a jaunt at the Foothills Dog Park. Despite all the excellent food and entertainment that is available in this stylish neighborhood, you might find yourself reluctant to leave the oasis of your Dakota Flats condominium. The sixteen units are split into two buildings, so each unit has only one shared wall. Each building boasts an elevator, ensuring the ease and comfort of single-level living for both first- and second-floor residents. Each two-bedroom, two-bathroom condo features modern architecture and a sleek, urban design. Large banks of windows provide perfect natural light and a constant reminder of your beautiful surroundings. Tall ceilings make for light and airy interiors. A gas fireplace in the living room and white oak floors throughout add a luxurious touch. 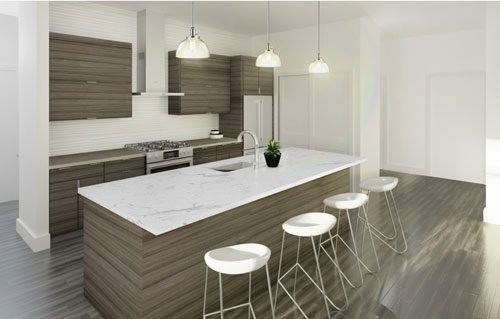 Dakota Ridge offers two high-end, contemporary finish packages: the ultra-modern Birch and the more traditional Aspen. Regardless of which interior package you choose, the kitchen of your Dakota Ridge condo will be equipped Jenn-Air stainless steel appliances, including a French door refrigerator, five-burner gas range, built-in dishwasher and drawer microwave. Quartz countertops and a kitchen island make cooking a pleasure. A free-standing soak tub and brushed nickel fixtures in your master bathroom offer a spa-like experience. Paint colors like coffee and eggshell throughout the condo provide a soothing-yet-bold aesthetic. Energy-efficient LED lights keep your energy bill low. At just under 1,700 square feet, these corner units are the perfect size for a couple with the newly-found freedom of an empty nest. Furthermore, the secure building with an underground parking deck and storage make Dakota Flats a perfect option for lock-and-leave seasonal travelers. Come to Boulder to enjoy some winter sports, and rest assured that your gear and your home are locked up safely while you’re away. Progress is steady on the construction of the Dakota Flats condominium buildings. The clubhouse, which will be used to hold HOA meetings and can be rented out by Dakota Ridge homeowners, is already complete. The West Building at 630 Terrace Avenue is almost fully framed, and the foundation for the East Building at 650 Terrace Avenue is under way. New construction is a rare opportunity in the Boulder area. 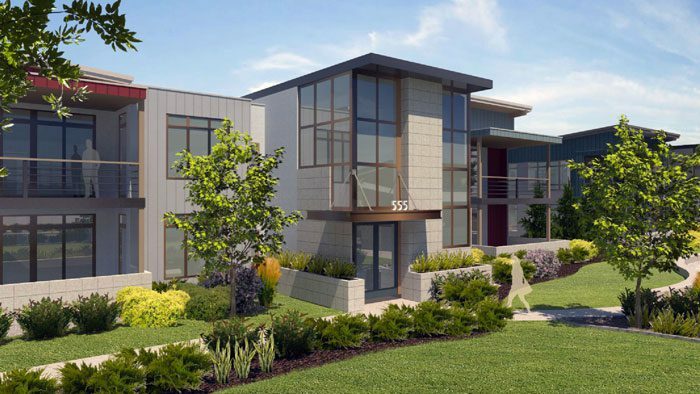 Buyers have recognized the value of the location and construction at Dakota Ridge, and several of the units are already under contract. The remaining units are priced between $899,000 and $949,000. By Emma Castleberry, for At Home. For more information, call John McElveen at 303.818.7500 and Jed MacArthur at 303.570.8655. For more information visit dakotaflats.com.